The suppression of trade barriers and liberalization of financial flows inherent to the expansive dynamic of globalization have not extended to international flows of workers. To impede the free movement of workers, restrictive migratory policies have been implemented, and borders have been fortified with walls and fences. In the face of this widespread phenomenon, this chapter presents an alternative consisting of three steps. First, it is noted that in the current migratory context, borders play a key role in reproducing inequalities between countries. 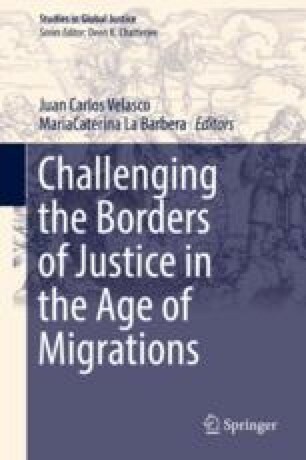 Next, it is argued that given the incompatibility of this function with global justice, it is necessary to seek some remedy to put an end to the suffering caused by this structural injustice, a suffering that is endured by an immense number of people unlucky enough to have been born on the wrong side of a border. After presenting a conception of borders that, unlike walls, would enable the movements of people, finally, a scenario is proposed in which the rights of political membership would be reassigned in a cosmopolitan manner and in which borders would usually remain open. Although this does not entail a radical suppression of the aforementioned injustice, its implementation would contribute to not only its reduction but also to the compensation of victims. Social injustice still needs to be denounced and fought. The world will not get better on its own. This work has been supported by the R&D project Human rights and global justice in the context of international migrations (FFI2013-42521-P). I am grateful to many friends and colleagues for their careful reading and constructive suggestions, in particular to Francisco Brotons, MariaCaterina La Barbera, Isabel Turégano, Federico Arcos, Daniel Loewe and Astrid Wagner. Henley&Partners. 2017. Henley & Partners visa restrictions index 2017 . In: https://henleyglobal.com/files/download/hvri/HP_Visa_Restrictions_Index_170301.pdf(26.12.2018).